Y’all, I do not know how I’ve gone so long without a food processor! A whole new culinary world has opened up to me, one where I don’t have to force my blender into overdrive and curse at it for not performing the functions of a completely different small appliance. It’s a world where I no longer I risk the loss of a fingertip when I grate and shred everything by hand, and I love it. I’m enamored with this new device! For my processor’s inaugural usage, I went with a hot-off-the-presses recipe from the PPK, the Quarter Pounder Beet Burger. My only other beet burger experience occurred at Northstar Café in Columbus, Ohio, when I was there on a work trip a little over a year ago. 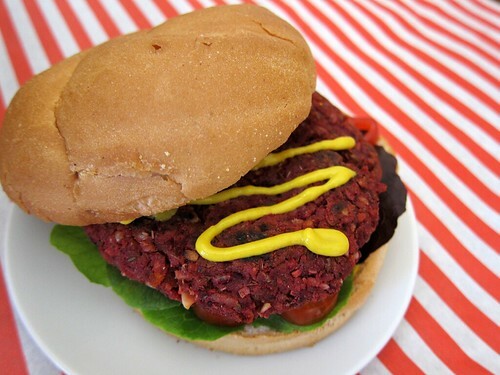 But I’d never made my own beet burgers, and it’s probably good that I waited until I had a food processor to help me out – even though I grated the beet by hand (old habits die hard! ), my food processor pulsed the brown rice, lentils, and beets into a perfect consistency with no arm-straining efforts on my part. Ah, laziness. What I really love about these burgers is that, on the surface, they seem like the quintessential hippie vegan food: Brown rice? Check. Lentils? Check. Oft-maligned vegetable? Check. But they’re incredibly filling – even a meat eater would be satiated by just one of these patties. So much for vegans eating rabbit food! I served my burgers with kaiser rolls, sliced cherry tomatoes (because, let’s get real, most winter tomatoes are a travesty not worth touching), arugula, and lots of ketchup and mustard. Delicious! What’s your favorite vegan burger recipe? What’s the most delicious vegan burger you’ve ever eaten? ← I Can Haz Food Processor!